Not a day goes by that any or all of these tech giants are not in the news, often in connection with troubling allegations about their abuse of the trust we place in them when we opt to make use of their sophisticated technologies that, in so many ways, make our lives easier. With new and massive data-breaches being revealed all the time, with incalculable damage being done to our society through hacks and “bots”, we have good reason to think about our relationships with cyber-technology. Many people, either because they are fearful of the misuse of their personal data or because they are increasingly aware of how much time they lose to their “screens”, are severing their links with social media platforms. Baruch Atah Adonai, eloheynu melech ha-olam, po-kayach ivreem. Praised are You, Adonai, Soverign of Existence, who opens the eyes of the blind. That blessing is part of sequence that reflects our first actions each day. Opening our eyes in the morning is likened to God’s giving sight to the blind. Many is the time that I have wondered how that particular blessing feels to a person who is blind or visually impaired. Now let me tell you about an extraordinary piece of software, a smartphone “app”, that I discovered two years ago. 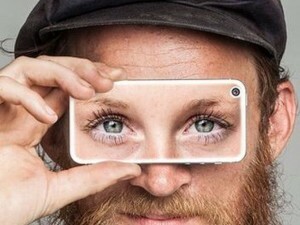 It is called Be My Eyes and was developed in Sweden by a software designer who realized that the ubiquity of smart-phones with decent video camera functions could be an enormous boon to people who are blind or visually impaired. Here’s how it works: Be My Eyes is a free app that connects blind and low vision people with sighted volunteers and Be My Eyes representatives for visual assistance through a live video call. Every day, sighted volunteers around the world lend their eyes to solve tasks big and small to help blind and low vision people lead more independent lives. The process begins when a blind or low vision person requests assistance by opening the app on a smart-phone. Through a live video call, that person and a volunteer can communicate directly and solve a problem. The volunteer will help guide which direction to point the camera, what to focus on or when to turn on the phone’s flashlight. When a sighted volunteer receives a video call, he or she assists that blind or a low vision user who may need help with anything from checking expiration dates, distinguishing colors, reading instructions or navigating new surroundings. This app is brilliantly simple, easy to use and effective. To date, it has been installed globally by 949,363 volunteers and by 67,647 blind people. In the two years since I installed the app on my phone, I have successfully responded to four or five requests for assistance. Because there are so many volunteers, if I am unable to respond to the app’s distinctive ring-tone, or do not do so quickly enough, I can rest assured that the call will be answered by someone else. In one call I helped someone identify what kind of frozen meat was in her freezer. Another time I assisted someone by telling her the color of a sweater that she wanted to match with other clothing. In another call I helped someone find expiration dates on packages of food. In another call I helped someone identify different gift cards in her possession. While the reach of the app is global, English speakers are always matched with English speakers. Such a simple act that engenders such a feeling of gratitude for being able to offer my eyes in the service of another’s need. I will never read that blessing–“…who opens the eyes of the blind”…the same way again.